We made landfall Saturday morning at 0900 local time as we passed Race Point at the entrance into Cape Cod Bay. Since leaving St John’s less than one week ago we had covered 1109 miles, at an average of just under 7 knots. This was the third 1000+ miles passage since the decision was taken, exactly four weeks ago, to abandon the attempt to transit the Northwest Passage. Since then Aventura has covered 3500 miles, and, to keep the statistics rolling, we also clocked over 8000 miles since leaving London on May 31. 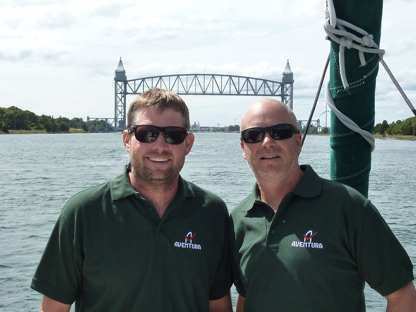 We are now on our way to the Cape Cod Canal bound for our final destination: Newport, in Rhode Island, where Aventura will have a thorough service on completion of this often gruelling maiden voyage, and also a cosmetic makeover for the forthcoming Annapolis boat show (October 9 to 13). 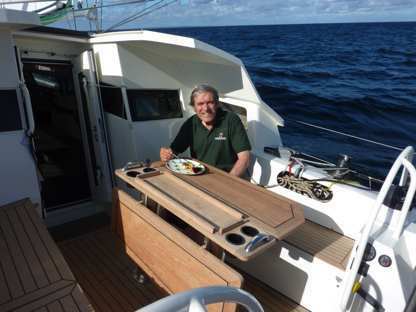 While streaking across Cape Cod Bay at over 8 knots, I cooked a captain’s special pancake breakfast for my crew Ryan and Lou, and enjoyed it myself sitting for the very first time at Aventura’s cockpit table, that had not been opened once during her sojourn in the cold Arctic. Sources of renewable energy at Aventura’s stern, with the Sail-Gen visible in the gap between the aft cockpit seats. Lou is the owner of Arctic Monkey, the fourth hull of the Exploration 45 design, of which Aventura is the prototype. He joined me for this passage to familiarise himself with this boat, but also to learn from my experience, and to pick up ideas on how to make his own boat better and more comfortable for Zetty and their three daughters: Zoe (7), Lia (5) and Rose (3). Aventura and Arctic Monkey share many features, one of them is the absence of a diesel generator, as Lou intends to use, as I do myself, renewable sources rather than burn fuel to generate electricity. To his great satisfaction his decision has proved absolutely correct as during the last four days of sailing, all our substantial electricity needs were covered by our Sail-Gen hydro generator, D400 windgen and 180 watt solar panel. 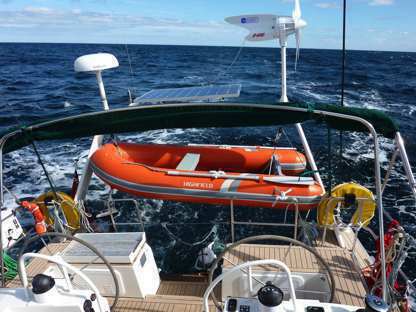 In spite of constantly using the autopilot, electric winches, instruments, refrigerator, navigation lights, radar, electric toilets etc the batteries were kept fully charged and there was no need to run the engine to charge the batteries. My irregular reports will be suspended once we reach Newport, but will be resumed on my return on October 4, when I shall sail Aventura to Annapolis for the boat show, where I hope that some of those who had followed Aventura’s Arctic adventures will pay us a visit on the Garcia stand (booth). 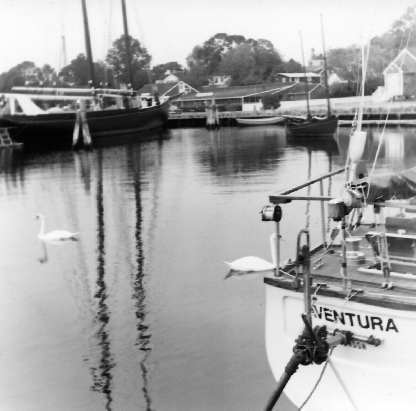 On the way to Annapolis, Aventura will sail in the wake of the first Aventura which passed through New York in 1977, and what’s more, Sunday will be exactly 37 years since our first Aventura sailed through this very Cape Cod Canal on her way south, to Panama, the Pacific and the rest of the world. 12 September 1977 Ivan’s 8th birthday; we were in Princetown and he had an apple cake. 13 September We went to Plymouth. 14 September Blowing and gusting hard. Forecast up to 25 knots so eventually left. Small craft warning. Closehauled, but couldn’t quite lay the entrance to the Canal. 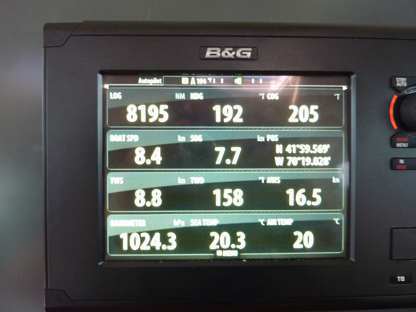 Wind seemed to get stronger and we did measure 34 knots. Had to motor the last mile crashing into the waves. In the Canal it was quiet and we powered through in 45 minutes with tide in our favour we must have been doing 10 knots. Came out into short sharp seas in Buzzards Bay, very unpleasant wind not so strong and decided to make for Woods Hole, which we could lay. Listened to radio and found out there had been a gale warning from 0930 all down the coast!!! Too late. Sailed through Woods Hole passage, narrow but well buoyed. Picked up a mooring, put dinner in the oven and went ashore.